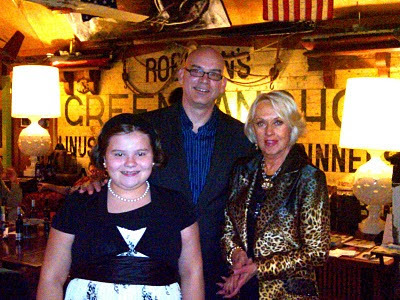 Tippi, Liza and me, after a quite delicious vegetarian lasagna banquet at the Anchor Inn. It was a quiet night in the Oregon Coast town of Lincoln City. A gloaming fog rolled in and herring gulls gathered to poke through scraps from nearby fishing boats. If you were at the local historic Bijou Theater, you'd be forgiven for imagining you were in Bodega Bay, circa 1963. Especially since its main attraction that night was Hitchcock blond Tippi Hedren, in town for a special screening of her breakout film, The Birds. 80 years young and sharp as a new Henckels, she was there to raise awareness -- and cash -- for the Roar Foundation and its sole beneficiary, Shambala Preserve. 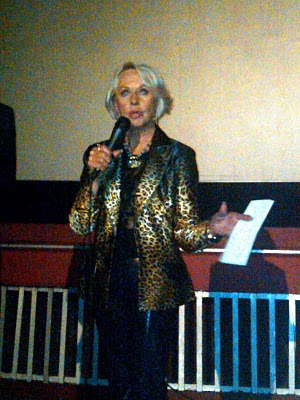 I had the honor of emceeing the event, introducing the still-working movie star, and joining her in a post-movie discussion. As a long-time advocate for animal rights, Tippi's wildlife preserve provides sanctuary for big cats, such as tigers and lions, who have been abused by ignorant "pet" owners and circuses. As great as that contribution is, her most far-reaching impact has been behind the scenes: in 2003 she she co-authored “The Captive Wildlife Safety Act,” halting the interstate traffic of exotic felines for personal possession, which was successfully signed into law by President Bush. More recently, she has co-authored a bill banning the breeding of exotic felines for personal possession. She and her entourage arrived at the theater around 3:30 for an autograph session ($20 a pop, each signature personalized and artfully executed, with all proceeds going to her non-profit). After that, I spoke briefly about the film and then it was movie time, during which she hung out in the lobby. At one point I dashed out of the auditorium to silence my mobile phone (I know! I know!) and caught her peeking through the curtain to glimpse one of the scenes, which she must have seen a thousand times. Tippi deftly parries one of my more probing questions. 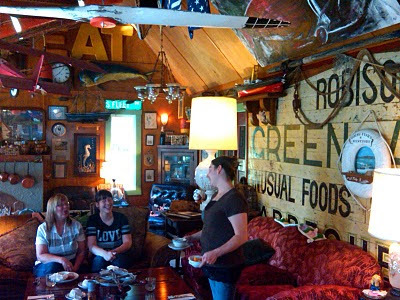 Then it was off to a banquet dinner at the historic Anchor Inn, where we mingled with local business leaders, Shambala supporters and movie buffs. So get this: from 3:30 to around midnight, Tippi hardly sat down as she talked, signed autographs and pitched her cause. After dinner, as patrons stumbled out the door to go home, she was left alone with the restaurant staff. So she went into the kitchen to meet the cooks. I hope to have such energy at that age. Looking good after all these years. 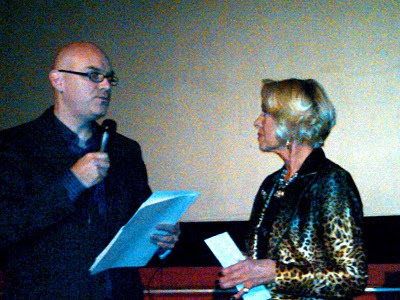 You can probably imagine what a thrill it was for me to meet Tippi Hedren. My Hitchcock geekery and her history with the director brought us together -- deftly orchestrated by Alex Ward and the Bay Area Merchants' Association. But my takeaway from the event was the even greater pleasure of getting to spend a bit of time with a remarkable woman who has leveraged her success to do something meaningful in the world. Not everyone can start a wildlife sanctuary, but there are thousands of orphan pets who likewise need to get into a good home. Next time you're looking to get a cat or dog, don't go browsing at the pet store. Drop by the local humane society and just do a walk-through. No commitments -- just look. Who knows? Maybe you'll get a nudge from the spirit of Shambala. Liza Gunz, aka Lisa Fremont of Rear Window, takes a break in the lobby of the Bijou Theater. Visiting a local merchant. "That's funny. They're dusting books where there ain't no books." Dining room at the Anchor Inn, the next morning. 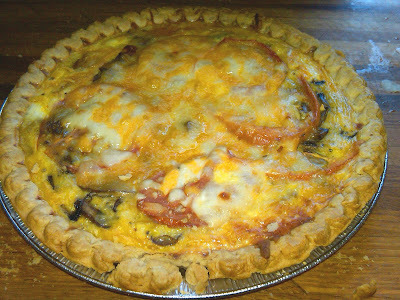 So much depends on a portobello mushroom and caramelized onion quiche for breakfast. That must have been very cool to meet Tippi Hedren. What a legend. I just stop by to say...Congratulation! I have to agree with you, actress Tippi Hedren, looks beautiful! 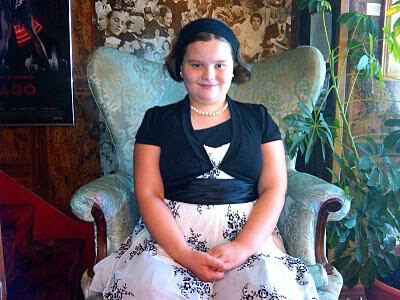 What I really can't believe is how your daughter Liza Gunz, has grown-up! 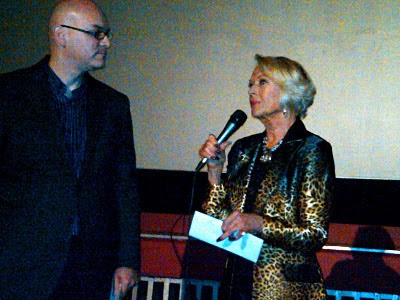 Joel said,"When the lights came back up, I interviewed Tippi and led the audience in a Q & A session. (I'm working on obtaining a video of the program, to be posted here.)" Wow! I can't wait to view the interview between you, and Mrs.Hedren. ...Once again, it seems that a good time was had by all...What a very special person Miss Tippi Hedren. Wow--is she really 80? She looks amazing, and that sounds like a long night. Thanks for sharing the story. 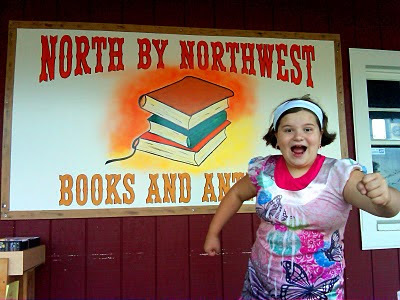 I hope you didn't "borrow Laura's Mercedes" to get to the North by Northwest book shop! Also your Lisa Fremont is adorable. Like the real Lisa, your Liza obviously "knows how to wear the proper clothes" - she's so cute dressed up to the nines! What a delightful blog post! So glad your Tippi shindig went so well. You all looked fabulous; special kudos to your daughter for rocking that Lisa Fremont frock! Great info - look forward to the video. A couple of months ago on BBC radio 2 Tippi was interviewed and she revealed that in the movie The Birds, she was not told until the last minute that real birds were going to be used in the scene where she gets pecked - no wonder she got awards - it wouldn't get past H & S today! She looks really great and lucky you! Tippi was a trooper then -- as she is now!